To Cite: Erkus S, Kose O, Turan A, Kalenderer O. Sciatic Nerve Compression Due to Proximal Femoral Solitary Osteochondroma: A Case Report and Literature Review, Shafa Ortho J. Online ahead of Print ; 6(1):e88168. doi: 10.5812/soj.88168. Sciatica is a radiating pain that starts from the buttock to the legs. Any condition that affects the sciatic nerve within its intraspinal or extraspinal course may cause sciatica. The most common etiology is the lumbar disc herniation; however, bone tumors around the hip joint are rarely reported. Herein, we report a case of solitary osteochondroma of proximal femur that caused sciatic nerve entrapment. The diagnosis was delayed due to the low level of suspicion and incorrect diagnostic imaging. Patients with sciatica should be thoroughly evaluated and extraspinal causes including space-occupying lesions along the course of the sciatic nerve should be kept in mind, particularly when the symptoms do not respond to conservative management in recalcitrant cases with negative lumbar imaging findings. Sciatica is a symptom rather than a diagnosis, and is defined as radiating pain along the sciatic nerve distribution that starts from the buttock to the legs (1). Any pathology affecting the sciatic nerve within its intraspinal or extraspinal course may cause nerve compression and result in sciatica. The most common cause of sciatica is related to intraspinal pathologies such as lumbar disc herniation and spinal stenosis. On the other hand, there is a variety of reasons and pathologies causing compression along the nerve path after it exits from the spinal canal (Box 1) (2). Among the causes of extraspinal sciatica, osteochondromas in pelvis or femur have been reported rarely. In a study evaluating 32 patients presenting with sciatica due to extraspinal tumors, only one patient who had sacral osteochondroma was reported (3). Likewise, Gocmen et al. examined peripheral nerve problems due to osteochondromas and found only one of the 20 patients with sciatica (4). Similarly, very few cases of osteochondroma leading to sciatica have been reported in the current literature (Table 1). In patients presenting with sciatica, spinal pathologies are primarily considered and evaluated. Therefore, extraspinal reasons are often missed. In this report, we present a case of sciatic nerve entrapment associated with osteochondroma of the proximal femur. The difficulties in diagnosis will be discussed in light of the literature. A 53-year-old man was admitted to our clinic with typical symptoms of sciatica lasting for one year. Previously, he was repeatedly assessed in neurosurgery and physical therapy clinics, and was treated with anti-inflammatory and muscle relaxant medications with a diagnosis of lumbar disc herniation although his lumbar magnetic resonance imaging (MRI) findings were negative. His past medical history was otherwise normal. On the physical examination, the straight-leg-raising test was positive. There was hypoesthesia in the sole of the foot and the Achilles tendon reflex was reduced compared to the contralateral side. Distal pulses of the foot were palpable. Because the patient had chronic symptoms, pelvic and lumbar plain radiographs were initially ordered. The lumbar radiographies were normal but pelvic radiographies demonstrated a pedunculated extramedullary mass arising from the proximal femur with a typical appearance of an osteochondroma (Figure 1). Considering the size and location of the tumor and the age of the patient, chondrosarcoma should be excluded. For this reason, further advanced imaging studies were performed. The computed tomography (CT) showed a bony mass arising from the posterior surface of the proximal femur (Figure 2A-C). According to MRI, the tumor was benign in nature. The thickest part of the cartilage cap was measured as 2 mm. Moreover, the compression of the sciatic nerve between the ischium and tumor was clearly depicted (Figure 3). As a result, sciatic nerve compression due to proximal femoral solitary, osteochondroma was the final diagnosis, and total excision through the posterior approach was planned. Figure 2. A, Coronal; and B, axial CT examination showing a pedunculated bony mass originating from the posterior cortex of the proximal femur; C, the sciatic nerve path and the relationship with mass are drawn and depicted in the illustration on the 3D CT. Through the posterior hip approach, gluteus maximus was longitudinally split and dissection was continued deep to short external rotator muscles. Short external rotators were pushed by the tumor. The piriformis tendon was found in the superior border of the tumor and was followed up to reach the sciatic nerve. 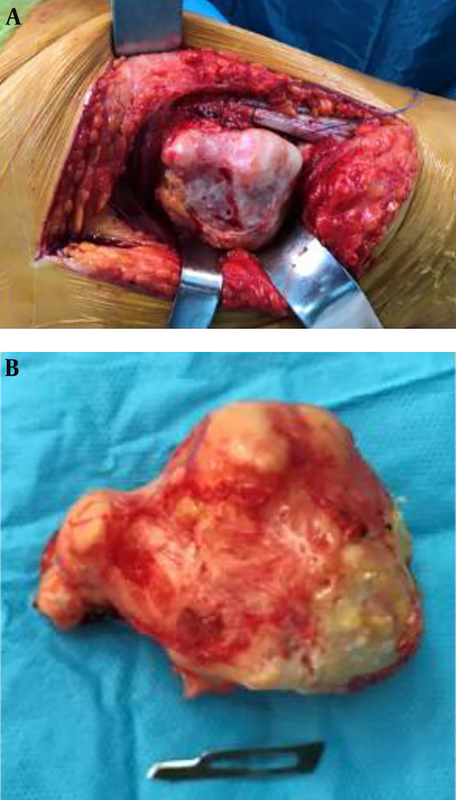 The tumor was removed from the thickest part of the peduncle with an osteotome (Figure 4A-B). A definitive diagnosis of osteochondroma was reported after a pathological examination. Immediately after the surgery, partial weight bearing was allowed with crutches. The postoperative period was uneventful. At the end of the first month, full weight bearing was achieved. Sciatica pain was completely disappeared and neurological findings returned to normal. At the final follow-up, six months after the operation, the patient had no complaints and returned to his previously normal life. 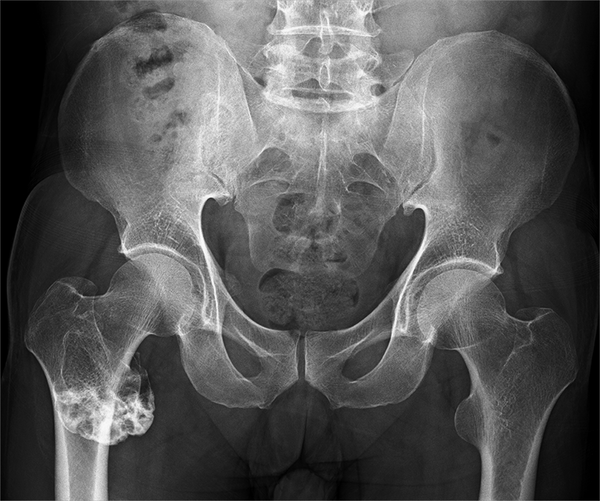 The final follow-up pelvic radiographs showed no signs of recurrence (Figure 5A-D). Sciatica is a common condition with a typical pain pattern and is often resulted from intraspinal causes. Therefore, these causes are considered in the differential diagnosis as a priority by the physicians. However, this classical approach sometimes may cause misdiagnosis and even incorrect operations with wrong indications. Sim et al. reported 38 patients with primary bone tumors that simulated protruded lumbar disc herniation at the initial presentation and underwent laminectomy (10). In general, imaging is usually unnecessary to evaluate sciatica at the initial presentation. Particularly, if the symptoms are acute or early-onset, diagnostic imaging may not be indicated at this stage (1). Nevertheless, some conditions suggesting extraspinal causes, such as an aggravated, localized, worsened pain, non-responsive to conservative treatment for 6 - 8 weeks, the imaging should be performed. The tumoral lesions causing sciatica-like pain might also be located in the pelvis. Thus, anteroposterior pelvis radiographies should also be included as part of the initial screening process. Based on the past medical history of our patient, we suspected an extraspinal etiology of sciatica. The normal lumbar radiographs and MRI, duration of symptoms, and persistent symptoms despite treatment were significant clinical clues. Fortunately, the tumor was a benign bone tumor, osteochondroma, which could be diagnosed with a simple plain radiograph. Although osteochondroma is usually asymptomatic, a variety of symptoms and complications can be seen depending on the size and location of these tumors. The most common presentation of these tumors is their pressure effect or entrapment on the neighboring anatomic structures. In addition, if the cap of the tumor is over 1 cm, it comes to mind that a malignant transformation leading to pain might be initiated in contrast to its benign nature. The definitive treatment for osteochondromas is the “en bloc” excision. In the case of nerve entrapment, simple excision usually provides the relief of symptoms (3, 4). Similarly, in our patient, complete recovery was achieved with the excision of the osteochondroma. In conclusion, besides intraspinal causes, extraspinal causes should also be kept in mind in the differential diagnosis of sciatica, particularly in patients with chronic, recalcitrant sciatica. This case underlines that patients with sciatica must be evaluated carefully, exactly, and meticulously. In case of suspicion, diagnostic imaging should be performed to include pelvis and along the course of sciatica. Posteriorly located osteochondromas in the proximal femur, if reach a sufficient size, may lead to sciatica. The simple excision of the tumor is a definitive treatment for these patients. Authors' Contribution: Study concept and design: Serkan Erkus, Ozkan Kose and Onder Kalenderer; analysis and interpretation of data: Serkan Erkus, Ozkan Kose and Adil Turan; drafting of the manuscript: Serkan Erkus, Ozkan Kose and Adil Turan; critical revision of the manuscript for important intellectual content: Ozkan Kose, Adil Turan, and Onder Kalenderer. Conflict of Interests: There are no conflict of interests. Ethical consideration: All study participants provided informed consent, and the study design was approved by the appropriate ethics review board. Funding/Support: No funding is declared. 1. Koes BW, van Tulder MW, Peul WC. Diagnosis and treatment of sciatica. BMJ. 2007;334(7607):1313-7. doi: 10.1136/bmj.39223.428495.BE. [PubMed: 17585160]. [PubMed Central: PMC1895638]. 2. 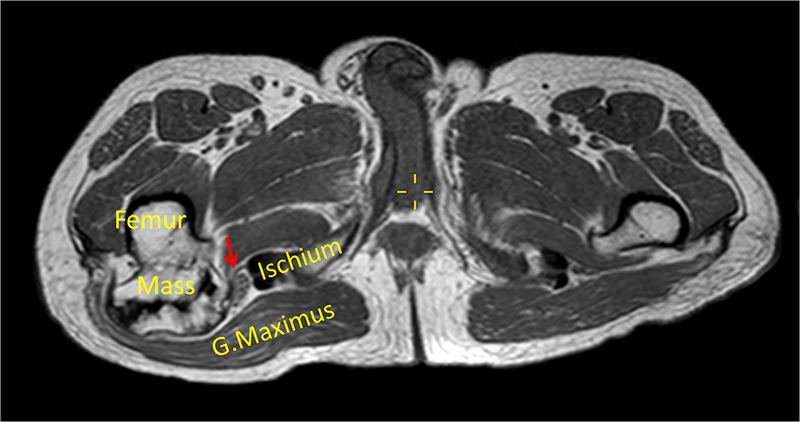 Ergun T, Lakadamyali H. CT and MRI in the evaluation of extraspinal sciatica. Br J Radiol. 2010;83(993):791-803. doi: 10.1259/bjr/76002141. [PubMed: 20647515]. [PubMed Central: PMC3473399]. 3. Bickels J, Kahanovitz N, Rubert CK, Henshaw RM, Moss DP, Meller I, et al. Extraspinal bone and soft-tissue tumors as a cause of sciatica. Clinical diagnosis and recommendations: analysis of 32 cases. Spine (Phila Pa 1976). 1999;24(15):1611-6. [PubMed: 10457583]. 4. Gocmen S, Topuz AK, Atabey C, Simsek H, Keklikci K, Rodop O. Peripheral nerve injuries due to osteochondromas: analysis of 20 cases and review of the literature. J Neurosurg. 2014;120(5):1105-12. doi: 10.3171/2013.11.JNS13310. [PubMed: 24405073]. 5. Yu K, Meehan JP, Fritz A, Jamali AA. Osteochondroma of the femoral neck: A rare cause of sciatic nerve compression. Orthopedics. 2010;33(8). doi: 10.3928/01477447-20100625-26. [PubMed: 20704099]. 6. 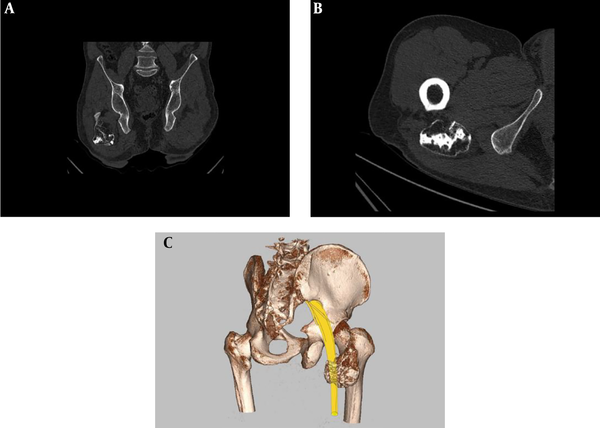 Deo SS, Deshmukh AA, Salgia A. Sciatica due to osteochondroma of proximal femur: A case report. Webmed Central. 2013:2-7. 7. Mondal S, Chowdhury A, Mandal PK, Roy D, Pal S, Gazi E, et al. Osteochondroma of femoral neck: A rare cause of femoroacetabular impingement and sciatic nerve compression. IOSR J Dental Med Sci. 2014;13(1):28-32. doi: 10.9790/0853-13112832. 8. Aldashash F, Elraie M. Solitary osteochondroma of the proximal femur causing sciatic nerve compression. Ann Saudi Med. 2017;37(2):166-9. doi: 10.5144/0256-4947.2017.166. [PubMed: 28377548]. [PubMed Central: PMC6150545]. 9. Akinyemi OA, Mabry LM, Dardenelle SI. Buttock pain and sciatica caused by a femoral osteochondroma. J Orthop Sports Phys Ther. 2017;47(6):442. doi: 10.2519/jospt.2017.6877. [PubMed: 28566052]. 10. Sim FH, Dahlin DC, Stauffer RN, Laws ER. Primary bone tumors simulating lumbar disc syndrome. Spine. 1977;2(1):65-74. doi: 10.1097/00007632-197703000-00009.